"additional charges at lease end"
I wanted to buy my 2015 QX50 at the end of the 4 year lease through Markham Infiniti . I was told, adamantly, that I would have to pay an additional $1299 + HST as a "Purchase Option Fee" and that "this is a fixed administrative fee and is non-negotiable and cannot be adjusted" by the Financial Services Manager. This additional mystery fee is over and above the end of lease buyout fee and any other charges. Please note that I'm buying the car out at the end of the lease - not any earlier than lease expiry. Nowhere in the lease agreement or Infiniti Finance website is this amount stated. I called Navi, the General Manager and was told someone would get back to me the same day. That never happened. I called Navi the next day and never got a call back. I then called Infiniti Financial Services (IFS) and even they were surprised at the amount. IFS then said I could send them a bank draft for the buyout amount + HST and they would send me the bill of sale. I would then go the Ministry and changeover the ownership which is what I did for a cost of $35. Nice try Markham Infinity but you have lost a customer. "Very good costumer service and advice." The best costumer service and advice from Geet who was very kindness all the time. We are very happy and satisfied. Thank you. Jorge and Luz. I took my QX60 for first oil change and 8000K service and asked them to check my car vipers which are not cleaning window from day one but they said it is normal wear and tear we will not fix viper you have to buy new one and pay 45 CAD. My car is 6 months old and under warrently but still Daywane and Jastin both managers said no. And not ready to talk even about it. "Good and above what was expected"
I have reacently purchased an Infiniti from Markham dealership the sales associate was Anastasia she was very very GOOD and made the whole experience a pleasure and a somewhat easy undertaking. I would certainly repeat any time If Ana was to be my sales associate.Thankyou. "Never do business with this dealership "
At first the sales give us a false hope to help us negotiate the price for a pre-own Q60. After talked to the Manager Vj, he said no more discount if the price posted in the internet. That will be the final price, but we find that the price can be receded. We didn’t buy the car which because the manager lies to us. Never do business with this dealer. Anastasia was efficient and professional throughout the whole process. Anastasia made sure no details were left behind. Would definitely recommend Anastasia and Markham Infiniti to anybody looking for a vehicle. "Terrible customer service, Vehicle damaged on delivery"
Tried to communicate with management and service department through email, chat and phone and still no return call. Also, my vehicle was delivered to me damaged and they did not take fault for it. Bumper was cracked, muffler was bent and the rim was all scuffed. Infiniti is a great brand, this dealership taints their name unfortunately take your business elsewhere, I know I will be. "Sales Rep - Anastasia - Excellent Customer Service"
Anastasia was very helpful in many ways to getting me to the right deal. Since the moment that I arrived, until I complete my purchase , her support was 110%. Not only helping me in negotiate with the manager, she went beyond, helping me also with my insurance company. After 30 days, she also asked about how my new car is going. It was important for me see that even after my purchase, she still consider my satisfaction. To sum up, I don`t know where I will buy my future car, but I do know who I`ll call. Excellent Service Ana, keep going. 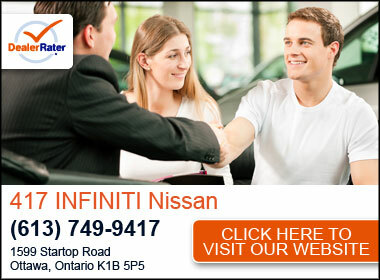 I had an excellent experience with Markham Infiniti. The sales rep was very helpful in terms of getting me the right deal. She worked me through the paper work and delivered the car in great condition. She is very professional and followed through with her commitment. "My used car purchase (2012 Buick Verano)"
I would just like to take this opportunity to give your Sales Rep ( Anastasia Turpin ) a warm and gratifying THANK YOU for her excellent work with our purchase of the 2012 Buick Verano she was quite instrumental in presenting the vehicle and was very impressed with her attention to detail and the right and honest answers to our questions which made purchasing this vehicle very comfortable. If there was a 10 ** rating she would definitely be a 10 she went over and beyond to make this purchase possible not just for me but for my Son who was also very impressed nothing but praise from him ! Again I would like to thank her for everything she has done to make my Son happy I would definitely Recommend Anastasia to who ever needs her service Way to go Anastasia Keep up the good work..!